Fleece fit for the gods. We call this little guy “Hagrid” due to the immense quantity of fleece which reminds us of Hagrid in the Harry Potter series. He is a mellow guy with tremendous coverage and impressive consistency. He went on to win Highest Scoring Brown in Cottage Fleece and Spin-off at the 2017 Alpaca Owners Association National Show!! Hagrid is a compact male with very fine fleece. At the American Alpaca Showcase the Judge noted that his fleece was finer than animals placed ahead of him. His size prevented him from placing higher. We expected this since he experienced an ulcer and some slow growth after shearing. Plus is sire and dam are both petite alpacas. If you like compact animals with phenomenal fleece, Hagrid is your guy! Sired by MFI Peruvian Right of Way quite possibly the most outstanding son of the incredible MFI Peruvian Cactus Jack. Pair those genetics with with MFI Jericho’s Peruvian Black Thunder out of Jericho on mom’s side and you have a powerhouse of fantastic fiber. If you do not have these genetics in your herd you will want to take a serious look at Hagrid. He has crimp from end to end, fine fleece and amazing staple length. We have a very small herd and have decided that Hagrid may be sold to the right farm. Our youngest child has added the stipulation that we get his next fleece. 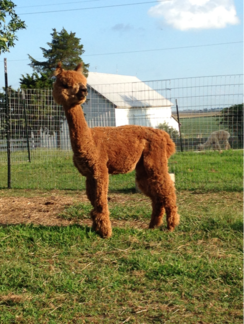 We will pay shearing costs (up to $35) for his 2019 fleece if you buy him. Also note, the purchase of Hagrid entitles the buyer to one breeding to any of our males, at any point in time for only $250. This breeding is transferable and can be used on any healthy female.